There are 2 young yellowheaded spruce sawfly in this photo. As they get older they develop an orangish head capsule. Has anyone started to see defoliation from Yellowheaded Spruce Sawfly? This small sawfly seems to defoliate spruce without anyone noticing until it’s all done. We saw significant defoliation in 2015 (Door, Marinette, and Vilas counties) and 2016 (Outagamie, Shawano, and Waupaca counties) and if the population is going to remain high this year you should start seeing the defoliation soon. There is one generation per year and they typically feed on new expanding foliage from late May to early July. 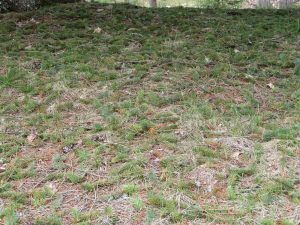 They will feed on all spruce (white, blue, Norway). The larvae blend in well with the needles so you’ll have to look closely as they can be difficult to spot. 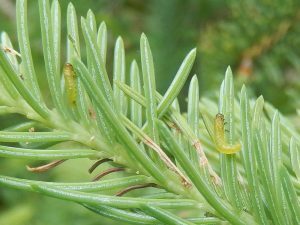 If you have had defoliation in previous years from Yellowheaded Spruce sawfly you should monitor your spruce to determine if spraying will be necessary this year. Repeated severe defoliation can cause tree mortality. More info can be found in this Forest Service publication. Spruce branch tips carpet the forest floor under a spruce tree. Squirrels will sometimes clip the ends of the branches off. Have you ever found hundreds of green branch tips lying on the ground underneath or around a spruce tree? You’re probably observing squirrel damage. No one knows exactly why they do this although Shane Weber (former NOR Pest Specialist in Spooner) reported that he’s watched the little buggers clip and drop the tips of spruce branches without any apparent reason for doing so. There are also reports that they clip off the branch tips, nibble the new buds, and drop the remainder of the branch tip. Michigan State University Extension has a document with photos of the squirrels eating the buds. I saw this damage near Woodruff this spring. Although it appears to be severe damage if you’re looking at the ground, when you look up at the trees you typically can’t see where any damage has occurred, so the health of the trees doesn’t appear to be compromised.